NBC’s popular drama Parenthood returns tonight with their season 4 premiere. It feels like it has been off forever. Season 3 ended way back in February 2012. If you have not watched the show before “Parenthood” is a one-hour drama inspired by the box-office hit of the same name. The show follows the trials and tribulations of the very large, very colorful and imperfect Braverman family. Sarah Braverman is a financially strapped single mother trying to raise two teenaged kids, the bright but rebellious Amber and sullen and sensitive Drew. On tonight’s premiere show called “Family Portrait” the Braverman family gathers for a family portrait before Haddie departs for college, while Kristina, Adam and Max have a hard time digesting the new change. Meanwhile, Julia and Joel struggle to adjust to their newly adopted son’s behavior and worry about their family’s future. Newlyweds Jasmine and Crosby disagree on the spiritual beliefs they should teach Jabbar. Mark proves his commitment to Sarah by altering a Braverman tradition, while she attempts to prove her worth as an assistant to photographer Hank Rizzoli (Guest Star Ray Romano). Also, Amber navigates a new job at The Luncheonette. Tonight’s season premiere looks like it is going to be great and you won’t want to miss it, so be sure to tune in for our live coverage of NBC’s Parenthood at 10:00 PM EST! 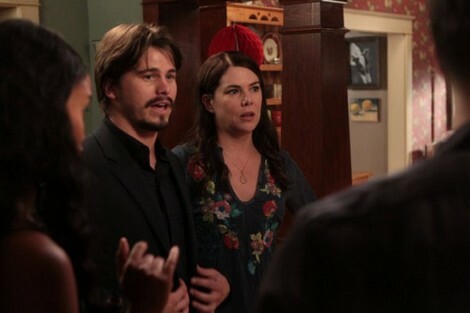 While you wait for our recap hit the comments and let us know why you are excited for the return of Parenthood! Tonight’s episode: Sarah and Mark are engaged, dad wants to know where the ring Is and how job hunting is going. Crosby walks by Jabbar’s room and sees him saying his prayers. Adam and Kristina want to go to Burger and Pie to be with the family before Haddie goes off to college, but she doesn’t want to go, she wants time on her own. Amber flirts it up with Nick and later hops in bed with him. Sarah goes to drop a deposit for the family portrait and sees a sign for help wanted and gives Hank, the owner, her credientials, he gives her the job on the spot. Max shows Victor his lizard but won’t let him touch it because he is adopted. Mark is upset that he is not aloud to be in the portrait, but Sarah explains that it is tradition that the couples have to be married to be in the photo. Crosby and Jasmine approach her mother about religion after Crosby caught Jabbar praying, they want her to leave it to them to teach him about it, not her. Adam and Kristina are at dinner with the family, the baby is crying, Max order the Torpedo burger and they don’t have it anymore so he gets upset. The dinner is close to being a disaster, the baby is crying and Haddie looks like she wants out. The family is all together for the family portrait, Sarah is on the job and extremely nervous as Hank is ordering her around. Sarah ruins the whole photo shoot with taking so long to get everything together and the sun has gone, the shoot is over. Jasmine and Crosby are discussing the whole religion thing and she tells him that God was a big comfort to her when she was young and basically she thinks Crosby is overreacting. At home, Kristina calls Julia because Max’s lizard is missing and Victor was with him, she is wondering if perhaps Victor knows anything about it. A girl arrives and has muffins for Nick, it appears that Nick is keeping two women busy and Amber is not happy about it. Sarah arrives at work to see Hank and he tells her that she is fired, he knows she lied about her experience and ruined her best shot. Hank tells her that he only hired her because he needed someone to load the van. Sarah wants her days pay, Hank wants to know what she thinks she earned. Crosby heads over to mom and dad’s for advice about religion, but they both tell him that he is on his own, he needs to figure it out. Victor’s parents confront him about the lizard, he says that he didn’t see it. Meanwhile, Max keeps talking about his missing lizard with Haddie but she interrupts him and tells him that she is going to miss him. Haddie bought him a present, a weighted blanket that a lot of people with Aspergers find comforting. It’s late, Kristina is waiting up for Haddie and Adam walks in, she tells him that she is a little upset that Haddie had no time for her all week. Kirstina tells Adam that Haddie is never going to live there again, they both look a little sad, then they share some wine. Adam and Crosby are at the studio, Adam wants Nick out for what he did to Amber. Before Crosby knows it, Adam tells the band to unplug and get out. Mark heads over to see Camille, he tells her that he is engaged to Sarah and therefore should be in the family portrait. Mark goes on to say that he is proud to be a part of the family and he wants them to be proud as well. Max and Haddie gets into an argument because he is going through all her things looking for his lizard. Haddie has enough, she grabs her sweater and leaves even though her parents remind her that her grandmother is having a surprise party for her later in the day. Hank is at the Braverman’s for the family portrait, it is also the surprise party for Hattie. Mark arrives and a lot of the family is surprised that he is allowed to be in the portrait. Amber takes Adam aside and tells him that he can’t jump in regardless if Nick was a jerk, she is an employee and he needs to start treating her like an adult. Adam is sorry, he didn’t like seeing Amber get hurt. Haddie shows up to the party, she finds Victor alone and he tells her that it is too loud in the room so he is checking out the timeline of photos that her family made to surprise her. The rest of the family notice that Haddie has arrived and they are all happy. Everyone heads out to the backyard for the portrait, Haddie looks really happy. Hank and Sarah are going over the photos, he gives her the proofs and tells her that if it doesn’t work out with her and Mark, he can Photoshop him out. As Sarah is leaving, Hank tells her that she is good at talking to the clients, but she needs to learn about photography. Sarah is surprised, for what it is worth, she has the job again. Drew is thrilled, Amy is back – they embrace and walk into the house but Amy has a strange look on her face. Crosby is sitting with Jabbar under the stars and tells him what he believes in, his family. Adam and Kristina are at the airport with Haddie, she has her boarding pass and is about ready to leave. They hug each other and Haddie walks away, Adam and Kristina are smiling and trying to hold back the tears, Haddie hurries back for another hug, they are all crying.